And you thought it was just a charming novelty project. 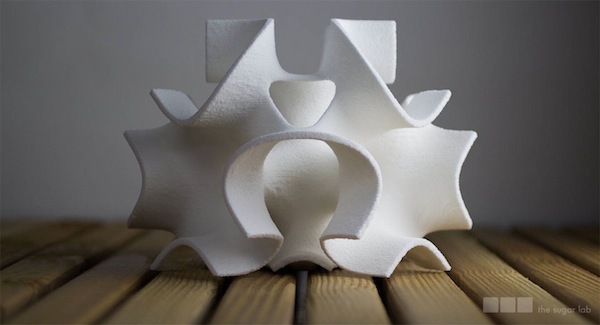 3D printing giant 3D Systems announced today that it has acquired The Sugar Lab, a startup “micro-design firm” based in Los Angeles, California, dedicated to 3D printing customized, multi-dimensional, edible confections in real sugar. The Sugar Lab has been using 3D Systems’ Color Jet Printing (CJP) technology to print on a sugar bed using different flavored edible binders that meet all food safety requirements. 3D Systems said it plans to immediately integrate The Sugar Lab 3D printing technique into its professional and consumer content-to-print platforms with a variety of production-quality applications as well as the ability to 3D print indulgences at home. The Sugar Lab was founded by Kyle and Liz von Hasseln, a husband and wife architectural design team in Los Angeles. They wanted to make a friend a birthday cake but didn’t have an oven so they decided to try to 3D print a cake instead. After a period of trail and error that lasted well beyond her actual birthday they successfully printed a tiny cupcake topper that spelled her name in cursive sugar. She loved it and they thought others would as well so they officially started The Sugar Lab in their studio in Silver Lake. “I believe there is a social covenant for indulgence that begins with desserts and The Sugar Lab will accelerate our ability to bring edible 3D printables to the masses while empowering chefs, restaurateurs and confectioners with never before explored digital creation tools for food,” said Avi Reichental, President and CEO of 3D Systems.